With about 95% of the bags already collected by passengers at our assigned carousel, I was starting to accept the reality that our luggage didn't arrive at Copenhagen with us. Cases of mishandled baggage during transit are not a rare occurrence. Dirty bags, damaged locks, missing bag tags, broken bag handles, — we've experienced all of them during our previous trips but to lose all our checked-in baggage in a 3 degC weather, that's a different story. Our delayed Singapore - Doha flight, I believed, was the culprit. We had a very tight connection in Doha of about 1 hour and it was even reduced to 10 minutes due to our late departure from Singapore. We were actually lucky that we managed to get to the boarding gate just before it closed and didn't miss our plane to Copenhagen. Or else we would have spent the next few hours at Hamad airport and waited for the next available flight. 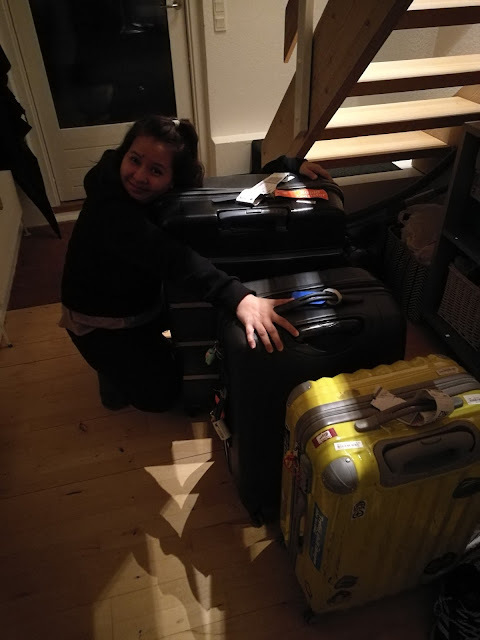 If you try to analyze it, the 10-minute window was not enough for them to find our bags from the first flight and transfer them to the second flight. So our bags were left at Doha Airport. we hoped. I was still secretly hoping that our bags would magically show up until the carousel was stopped and all the unclaimed bags were collected by the airport staff. That's when we approached him to report about our missing bags. He then directed us to the arrival services counter. We handed our travel documents and described each of the 3 missing bags to the man at the counter. After a few minutes of typing on his computer, he turned back to us and informed us that they've located some bags but cannot verify if those were ours. There's another passenger from our flight who lost her baggage too. We were a bit relieved that there was a big possibility that 3 of those bags were ours and can be delivered to us as soon as possible once confirmed. As the saying goes, "Better Late Than Never". Lucky that there's a WIFI inside the airport so we were able to get in touch with my husband's bosses who were already waiting for us outside. We used their address for the delivery of our bags and their contact number since we didn't have a local number (and to avoid being charged for roaming calls). We were given a copy of the Property Irregularity Report which contained our flight itinerary and bag tag numbers so we can keep track of them online. The report also came with this "apology letter" from Qatar Airways. And as compensation for our delayed baggage, we were given DKK 700 ($100) so we can buy some stuff. I don't know if it's the standard amount but at least we got something. I've read stories of other travelers who received their compensation only after a few weeks while others didn't get anything at all. Though honestly, the amount given to us won't be enough to buy a decent jacket or coat for that kind of weather (lucky if they're on sale). Glad we have someone to borrow extra clothes from. We just laughed off what happened that day and just hoped that our bags would be returned soon. It was very cold outside and I was only wearing a cotton tee, cotton trousers and a scarf— my normal airplane outfit. At least my husband has his hoodie. Inside our carry-on bag was our extra pairs of sneakers, flip flops and snacks. Oh and the amenity kits from Qatar Airways (socks, toothbrush and eye mask). Lol! What a funny way to start our European trip! I cannot even use my camera because the battery charger was in my luggage too. Haha! That afternoon, we went to the mall to get some undies, basics and toiletries. The following day, we received a call that our bags were being processed for delivery. Hooraay! Me and our luggage at 12 midnight. All complete! Thank you, Qatar Airways! 1. Do not panic. It won't help. 2. Go directly to the baggage handling services. If you cannot find it, approach any airport staff. 3. Make sure you do not leave the airport without filing a report. The earlier you get to report about your missing baggage, the quicker and easier for them to locate it. 4. Ask if you'll get any compensation. Since it was our first time, we were not aware of this and were surprised when they handed us some cash. 5. Ask your insurance provider if lost luggage is covered.